In the recent times, there is a considerable increase in the number of Startups by Entrepreneurs. Most of these Entrepreneurs start with a conviction (or an assumption) that by starting their own business, they can run on their own, they will be able to generate more revenue and would be able to utilize their time more effectively. But most of them realize on the course of their Startup journey that starting and setting up a business which works effectively, is not easy as it appears. There are several challenges involved ranging from choice of the industry, the timing of the entry, the marketing strategies to employ, to the availability of the resources among others. Today, there are not many formal means for entrepreneurs to seek advice and counselling from the learning of predecessors. Every startup today has to reinvent and transition to next step resulting in the loss of focus and resources. How would it be if we have a platform that can help reduce the pangs of entrepreneurial journey using the “power effect of network”??!! How would it be to have a platform that could cater to end-to-end startup needs across the world??!! How would it be to democratize many operations of startup eco-system??!! Welcome to moolya – the world’s first comprehensive global digital startup ecosystem!! It is a blockchain-based entrepreneurship ecosystem that offers support, learning, opportunities, regulation, and value-added service to its community of users. Raksan is an integrated incubator of quite a few SaaS platforms that are innovative and globally scalable. Raksan has many Startsups that are incubated, of which moolya is one. In Sanskrit moolya denotes intrinsic value of something, the English meaning of which is money. moolya is world’s first digital platform for the Startup ecosystem users of institutions, ideators, startups, investors, companies, service providers and other enablers like anchors, advisors, mentors, gurus, captains and partners to converge, explore, collaborate, conduct, transact, trade, service, synergise and prosper in their efforts. With time tested concepts of clusters, chapters and subchapters, moolya emulates the offline model of an ecosystem and model it up to present it as digital rendering of an “ecosystem of ecosystems” on moolya. Using a patent pending process, Team Moolya (referred to as Team-m) has built a SaaS platform for boursing and trading process operations and conduction of an ecosystem that will let users to find infinite possibilities and get their moolah (intrinsic value of something). moolya as the world’s first digital startup ecosystem is ideated by the Founding members out of their learnings as a startup entrepreneur in India and the travails and pangs they faced in the process. moolyacoin is an ERC20 token of a patent pending innovative SaaS platform - moolya.global - a culmination of an interaction network, marketplace and on-demand service platforms offering services using the Ethereum blockchain framework and moolyacoin as its preferred mode to access and conduct transactions. 1. Like most blockchain solutions they seek to decentralise operations on their global platform of ecosystems of ecosystem connected digitally using custom built processes and workflows. moolya platform is made LIVE and available ! Launch and integration of moolyacoin on ‘moolya.global’. Disclaimer : Please note that we are not associated with the ICO nor are paid for preparing this review. This is our personal opinion and contributors are advised to do their due diligence before contributing to the ICO. ‘moolya.global’ is the ‘World’s 1st LIVE Global Digital Startup Ecosystem’ which replicates all the global offline startup ecosystems and provides its 6 vital communities such as ideators, startups, investors, companies, service providers and institutions with digital avatars for online interactions and transactions. 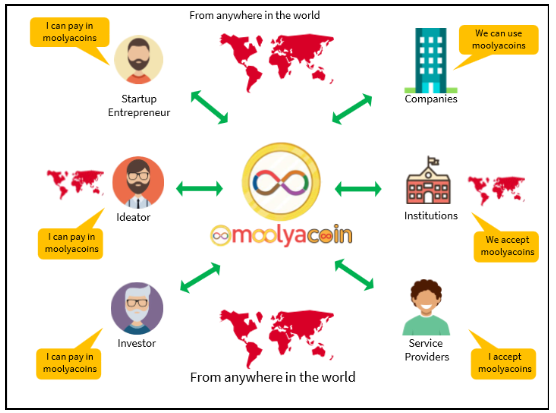 ‘moolyacoin’ is an ERC20 token of moolya.global - a culmination of an interaction network, marketplace and on-demand service platforms offering services using the Ethereum blockchain framework and moolyacoin as its preferred mode to access and conduct transactions. Below is the score we have given for each parameter and overall rating of the ICO. Please continue reading for detailed analysis. Most Startups are not truly digitised and still offline in adoption of interaction. Moolya as a platform addresses all the above challenges. Firstly MoolyaCoin attempts to bring all interested parties (all the above) to a single platform so they can explore, collaborate, transact, trade, and synergize together. Using a patent pending process, the team has built a SaaS platform to enable the trading process operations and conduction of an ecosystem that will let startups and users get the first-hand information / knowledge about the challenges faced by successful entrepreneurs. In a nutshell, moolya helps its global users focus on their core business aspects and use the digital workflows and services on moolya, for activities such as raising investments and getting their operations serviced. This platform gets a 9 on 10 in terms of their choice of the problem statement and their attempt to use block chain to address the aforementioned challenges. You can go through their whitepaper in the ‘Details’ tab. Their whitepaper is available in multiple languages – English, Russian, Arabic, French, Japanese, German, Croatian and Korean. The whitepaper provides information about the ecosystem, the executive summary, Platform details, the project roadmap, the token model, token distribution, the token usage, details about the project team among others. The white paper carries details of the technical architecture – technology stack and the framework, which we rarely see in the ICO whitepapers these days and we really liked it being included in the white paper. We give them 9 out of 10 on this aspect. Most of today’s ICOs are generally accompanied by just a whitepaper. Very rarely we get to see ICOs that has a fully LIVE platform, before the actually ICO. Moolya is one such rare ICO and its digital platform is fully LIVE (moolya LIVE Beta) since Jan 2018. The following key features are already live in the platform. moolyacoin had recently partnered with KYC3 for comprehensive KYC & AML verification. They have also filed a patent for global applicability and is currently pending. The icing on the cake is that they have come up with Utility tokens (moolyacoin) for usage on LIVE platform moolya.global and so users can start utilizing the coins on the platform even now. Though there is very minimal digital footprint here in the form of contribution to the repositories, we feel that having a repository link in itself is a good sign. Overall, we give them 10 out of 10. The company is established in Tallinn, Estonia with a Registry Code of 14520499. The founding members are Mr. Rakesh Naik (Executive Chairman & Founder), Ms Usha Nirmala (CEO & Co-Founder), Mr Rudra Pratap (CMO & Co-Founder) and Mr Ramana (CTO), all of whom have vast industry experience and are all result focused enthusiasts, specialising in business, technology and multiple domains. Their LinkedIn profiles are compelling as well. One standout aspect about this team is that they have an exceptionally strong team of advisors across the globe covering several disciplines. Moolya is not a company of today, as the core team has been in operations for the last 5+ years, understanding the Startups and they have quite a few SaaS platforms, which are innovative and globally scalable. moolya.global is one of the team’s flagship platforms and the team has spent over 24 months ideating, engineering, building and making the platform live before the launch of our ICO. Acknowledging the fact that a Startup of their nature and background needed good technology advisory, the team had entered into a technology partnership with Gartner. We are impressed with the initiative by the core team, AMA - Ask Moolya Anything (https://www.youtube.com/watch?v=fvAFJvtfgY), which is a series that is aimed at addressing and responding to the questions of the investors by the Founder members. We had an interaction with the Founding members about their vision and passion about the project and are quite amazed by their clarity, farsightedness and energy for the project. Excerpts from our interaction with each of the Founding members is as below. We give them a 10 on 10 for the core team’s vision & capabilities and for bringing on board the most relevant people across the globe, as advisors. ﻿moolya seeks to raise USD 3 million (Soft Cap) and USD 25 million (Hard Cap) in this ICO. Out of the total number of moolyacoins available (1,000,000,000), 480,000,000 tokens (48%) are available for sale during the ICO period. That makes the overall valuation of the company as a little over $50 Million which is very attractive. Many ICOs in recent time just try to encash investor euphoria by raising much more than the real valuation suggests. So we really liked this aspect of moolya ICO. An interesting aspect to be noted here is that the founders have invested their own funds of 2 million USD + for engineering and building the complete platform. This was done by them to retain their full liberty of their ideation process and operational freedom. This really reflects the team’s commitment towards their objectives in a non-negotiable manner. We give them 8 out of 10 for pricing. Their fundamental business model relies on Metcalfe's law of network effects and achievement of that critical mass of community users. Their business is to build that critical mass by aggregating, converging, and digitising the Startup community members. The revenue stream will depend a lot on how the ICO grows in the global stage. With the reach Moolya has got across the Globe and with the careful planning and ideation by the team for the past 2+ years, things look under complete control. Their policy regarding accepting payments of fiat money and other crypto-currencies as payments is an undoubted advantage and made for the convenience of all users. Recently moolyacoin has received a strategic investment of 2.5 million dollars from Pecunio VC Fund, which is a reflection of their ability to attract investors. The deal delivers up to $2,500,000 of assets for moolyacoin and showcases the coin as well as the platform ‘moolya.global’ as a company to investors worldwide under the Pecunio listing. Overall, we give them 9 out of 10 for this aspect. We are given to understand that the Top 10 ICO advisors of the world have signed up with Moolya on pure token basis (not retainer payment). This by itself is a testimonial of the value of the moolyacoins and there is a high probability of the token values to increase considerably. The introduction of moolyacoin aims to promote the cause of moolya.global. This is because the introduction of cryptocurrency promotes the cause of moolya.global, furthering the adoption of moolyacoin, the common transactional coin allowing the community users to access various services of the moolya.global platform. moolyacoin is designed to make payments easier, faster and it will be used for all trade transactions within the moolya digital ecosystem. To encourage the use of these token, users that makes use of it will be given special benefit in form of preferential transaction fees. This token will also be able to achieve the creation of smart contracts and storage capability because of its foundation of Ethereum blockchain and to increase the value of the token, the Moolyacoin usage will be propagated on the platform. Moreover, Howey’s test has confirmed that moolyacoin is a Utility token (Howey’s Test determines whether a cryptocurrency can be classified as a security and regulated). The coins will be locked for the entire duration of the ICO and further for a duration of 3 months post formal closure of the ICO. Moreover, the left over coins will be burnt to maintain the sanity of the token economics, which is a plus. We give them 9 out of 10 in this aspect. (c) Create the required traction to attract more people as members / followers in each of these platforms. Moolya scores big here. Very big indeed! Moolya has its presence (and very high traction) not just in the common platforms like Twitter, Facebook, Telegram, LinkedIn, YouTube, but also has its presence felt in other medium like Pinterest, Google Plus, Flipboard, Reddit, Instagram, Tumblr, ScoopIt, Slack, vk.com, Quora among others. You name it, they are already there. We regard that one of the key ingredients of a successful ICO venture is its ability to adopt a well marketed strategy to have very strong social media presence. Moolya is well aware of this and the bottom line is that “If you are a Crypto enthusiast or an investor, you cannot escape from Moolya’s social visibility”. Another interesting thing that the team has been coming up with on their social media platforms is a “Crypto Awareness” series, the intent of which is to offer inputs on the various Cryptocurrency jargons to newbie investors. We give them 10 on 10 for their presence in wide range of social media platforms, for their content and for the traction they have managed so far. Moolya is a certainly a first mover in the market, to envisage such a digital platform converging all the stakeholders of a Startup ecosystems. With a patent pending globally and it’s making of 3+ years effort, Moolya has certainly steadied their ship already. Other players like startups.co, AngelList, Gust are there in the market, but they cater to only one or a few of the 6 communities that moolya actually hosts. Also we feel that the head start Team Moolya has had in their thinking and ideation, leaves them way ahead of all other piecemeal providers. We give them 10 on 10. Based on our analysis, we give an overall score of 93.5 out of 100 to Moolyacoin, which is Fantastic. Based on our analysis, we feel that Moolyacoin has already started its disruption in its field of activity and is well the one to watch out for the investors and the Startups. We give them “Star Potential” rating and a short / long term investment option.